In order to maintain the quality of encyclopedic content in the face of exponential growth in the contributor community, Wikipedians developed automated (bots) and semi-automated tools (Huggle, Twinkle, etc.) to make the work of rejecting undesirable contributions waste as little effort as possible. These tools are apparently effective at their job. What I would be interested in is a systematic comparison with other language versions such as the German version, where newcomers have never been greeted by bots. However, also in the German Wikipedia bots are of increasing importance in terms of edit counts (see the paper “Work-to-Rule” on algorithmic governance in Wikipedia by Claudia Müller-Birn, Jim Herbsleb and myself). In any case, comparisons of different language versions would help to more clearly differentiate between algorithmic and other reasons for Wikipedia’s editor decline. Two thoughts come to mind after reading this interesting explanation. First, might the decline in new contributors not also, at least partly, have something to do with a “taken-for-granted” effect? i.e. : when Wikipedia was new, even causal users were aware of its dependence on user input. Today it’s just ubiquitous, so why contribute? Second, what might the algorithm bureaucracy issue say about another of your areas of research: pirate politcs? After all, the Pirate Parties promised a very “algorithm”-based approach to politics, to “reconfigure” democracy. Thanks for your comment, Phil! With regard to your first point, I think such an explanation cannot explain the sharp decline beginning in 2007; it would have rather lead to a more slowly and S-shaped reduction in editor growth. Furthermore, Halfaker et al. 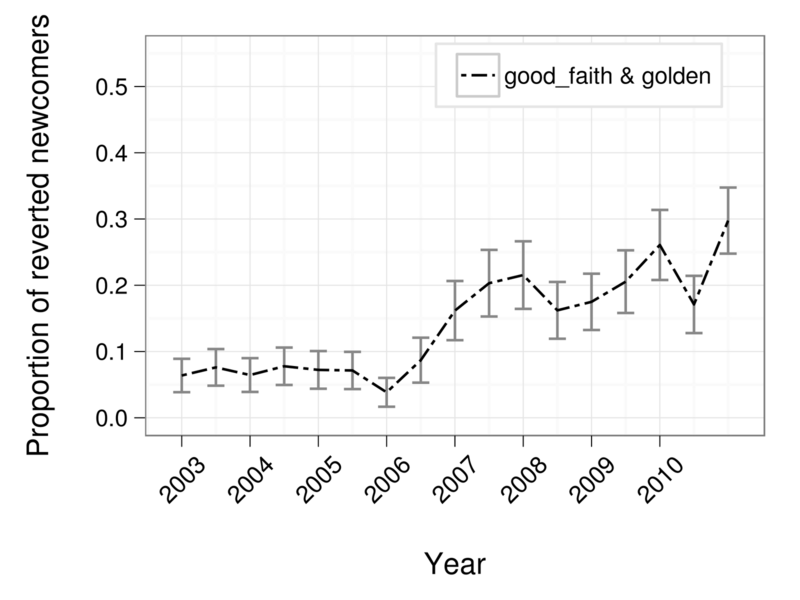 show that the number of new “good-faith”-contributers did not go down but the proportion of them being reverted increased. With regard to the second point, I can only speculate that we are still in the very early stages of understanding how more algorithmic approaches towards organizing will eventually play out..